Even though I've been sat in bed with Tonsillitis, wearing absolutely no makeup for the past week, I thought I would share the makeup I've been wearing lately/before I was taken down by this horrific illness which has made me feel like death. 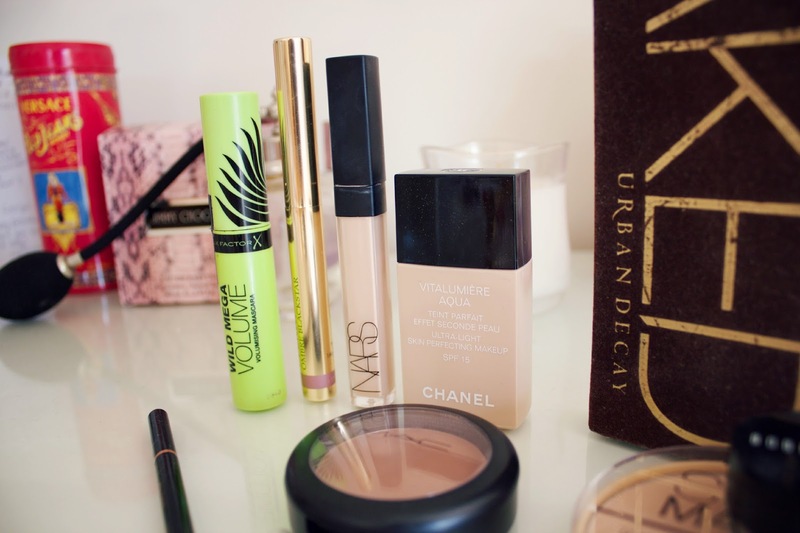 Moving on..I recently purchased the Chanel Vitalumiere Aqua foundation, my first Chanel makeup purchase ever! This foundation isn't one I would generally go for, it's very liquidy and I generally wear medium to full coverage foundations which this definitely isn't! I'm still not 100% sure how I feel about it, it is very similar in consistency to the Mac Face and Body foundation and I'm still trying to work out the best way to apply it, when I have tried it out for longer, I will do a full review! Under my eyes I use the Bobbi Brown Creamy Concealer, this is perfect for my under eyes as they get quite dry and this has a really creamy (as the name suggests!) 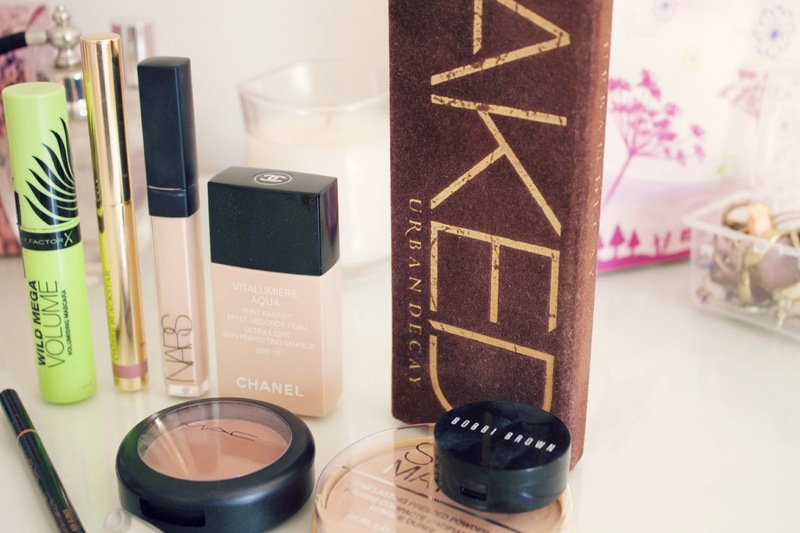 texture and it's brilliant for dark circles! On blemishes i've been using the Nars Creamy Concealer which is my favourite but is running out *sobs* everyone knows how difficult the lighter shades of this concealer is to get hold of, it's almost always out of stock! 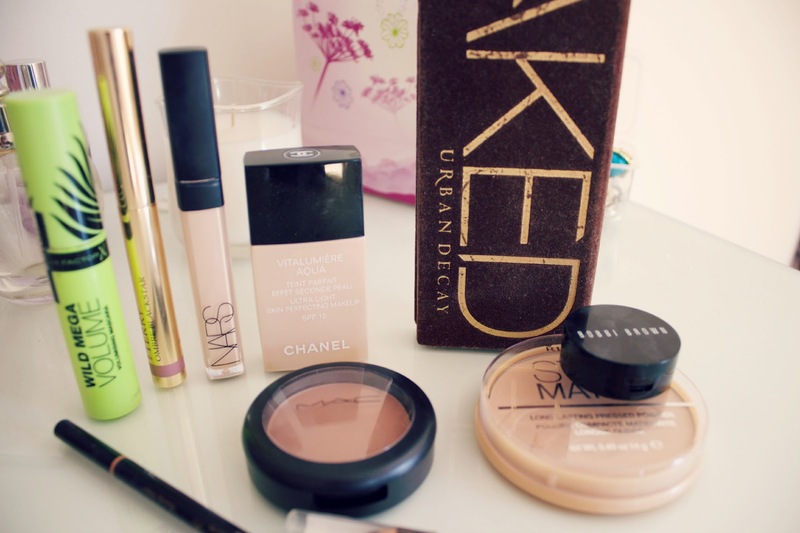 For powder I use the Rimmel Stay Matte Powder which is a really affordable but great product! I also recently purchased the Mac Blusher in Harmony which I have been using to contour as it is the perfect shade and is matte. On my eyes I start with the By Terry Ombre Blackstar in Misty Rock all over the lid and then apply Naked from the Urban Decay Naked Palette in the crease. I then apply one of the darker brown shades (I just pick one at random from the palette!) to the outer corner. I then apply a brown eyeliner on the upper lash line (the one I use is from Loreal) and then apply mascara, the one I'm currently using is the Max Factor Wild Mega Volume which is good however I prefer slightly smaller brushes as I find them easier to use! For my brows I absolutely love the Anastasia Brow Wiz, it is by far the best brow product I have ever used! After using my friends Naked palette I've been so keen do get my hands on one. Vitulumiere aqua is my favourite everyday foundation as I like light to medium coverage. Chanel recommends applying it with your fingers which is what I do and it gives the most beautiful natural finish however if you want slightly more coverage i would suggest using a brush like the sigma flat top kabuki brush or the real techniques buffing brush. They will give you a flawless finish and you could always build it up a layer. It is slightly like face and body in texture like you say but definitely more coverage! I've had to put my f&b away now the weathers heating up because it kept melting half way through the day which isn't the best look!